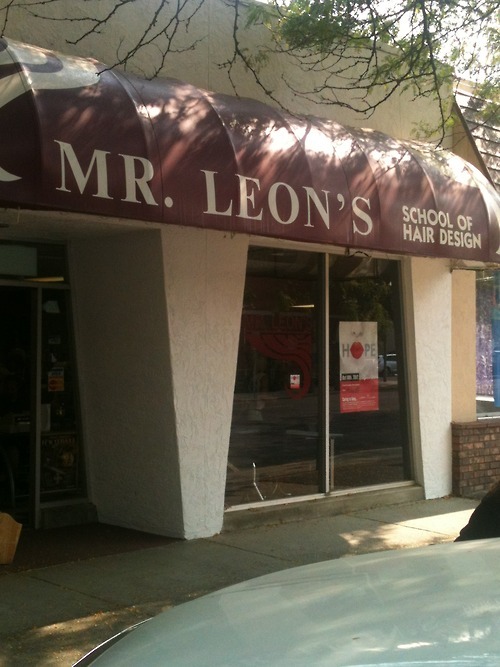 LEON'S SCHOOL OF HAIR DESIGN!. 당신 can see a poster says " No Hope Left " just like Resident Evil 6....lol. Wallpaper and background images in the Leon Kennedy club tagged: resident evil leon kennedy resident evil 6 leon s kennedy leon scoot kennedy leon kennedy hair leon kennedy haircut leon s kennedy haircut leon s kennedy hair. This Leon Kennedy fan art contains 선술집, 탭 하우스, 주점, 수돗물, 탑 집, and 식당. There might also be 다양한, 멀티 플렉스, 브라 세리, 천막, 차양, 햇빛, 양산, and sunblind.